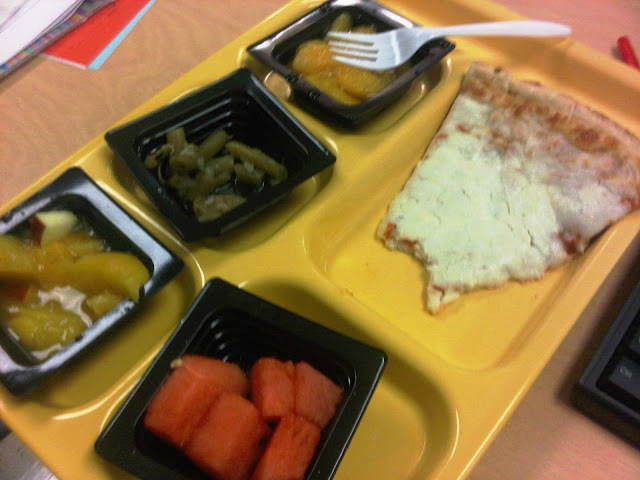 Call it disgusting if you want, but I have always been a cafeteria food kind of girl. I don't know if I took my lunch to school even once during elementary or high school. I didn't want to in middle school, but buying cafeteria food was extremely uncool during that time, so you know how that goes. We even had Taco Bell at my middle school, so it was pretty unfortunate that I had to eat hotpockets instead. During student teaching a couple of years ago I was introduced to "teacher food." Heaven!! Larger portions, more cheese, and more options. 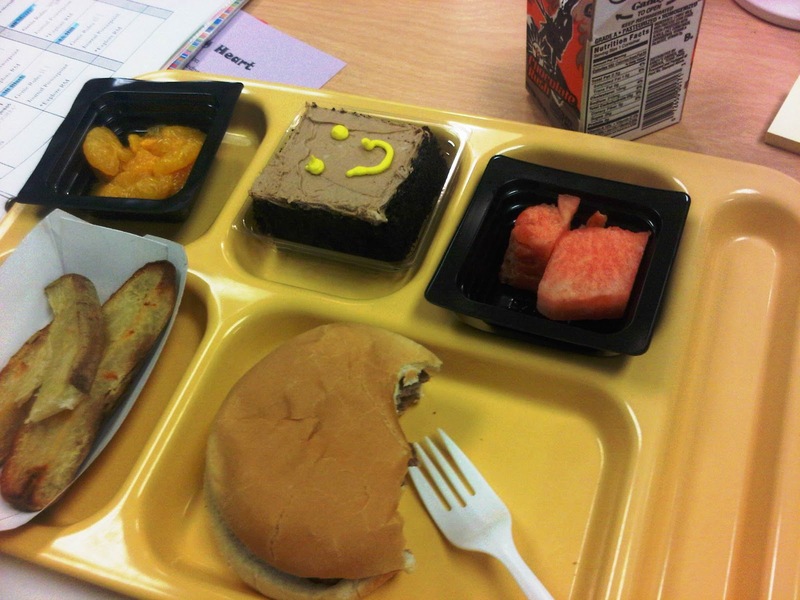 Needless to say, I was pretty pumped about getting to eat school cafeteria food again when I got my job this year. On the day before school started we received an email stating that teacher meals had gone up to $3.00, and there would no longer be special teacher items. Okay, unfortunate, but not that big of a deal. The first couple of days weren't too bad... I received two slices of pizza rather than one, was allowed to get two rolls if I wanted, and got to eat gravy with my chicken nuggets. Then, out of no where, things started getting a little less lovely. Apparently, there is a new rule in Abilene that states that teachers are not allowed to eat larger portions than the children due to issues with fairness. Middle schoolers are not allowed to eat more than elementary students, high schoolers are not allowed to eat more than middle schoolers, and teachers are not allowed to eat more than high schoolers. You get the drift. This includes purchasing extra dessert items (such as ice cream sandwiches). Children are not allowed to, so neither are teachers. You would be amazed at how many issues this has caused with people. I had a really hard time adjusting to all of the strict new rules, and for the first few weeks it was almost miserable for me to go to the cafeteria because I didn't want to get in trouble for getting one too many items containing bread, milk AND tea when I'm only allowed one or the other, asking for cheese on my nachos, or wanting my taco salad sans lettuce. People, these options are NOT a choice! The only difference between my meal and a kindergartener's is that mine costs twice as much for reasons that I am still unsure of. Every Monday is pizza day. You are allowed one slice of pizza and 4 choices of fruits & veggies. I go home starving every time I eat my mini cafeteria portions, yet I still continue to eat there due to general laziness and lack of time to make my lunch in the mornings. Granted, I do not eat everything on my plate. The veggies and fruits are often very bland. Perhaps I wouldn't be so hungry if I would try to force everything down. Last week we received a letter from the head of foods person that attempted to provide an explanation for the strange rules that have come about this year, but it ended by saying that things are not going to change. At least we'll shed a few pounds! Since when does an 16 - 18 yr. old eat the same amount as a 5 yr old????? Some one has some really screwed up ideas. Wow! Hope you don't lose weight. You don't really need to. Hit 'em. Wreck 'em. The show must go on.